Today I got caught in the rain on my way back to the office after lunch. It fit my mood so I went with it. I am having a hard time understanding why dating has to be so hard. Someone said to me today that being single is like not having a job. You find temp jobs and have lots of interviews, but never land the job. I've been at this game for 12 years now. Crying on and off since I got on the subway this morning is not good for my makeup. Or my morale. Let's go dancing and hook up with strangers. Sound good, everyone? I thought so. 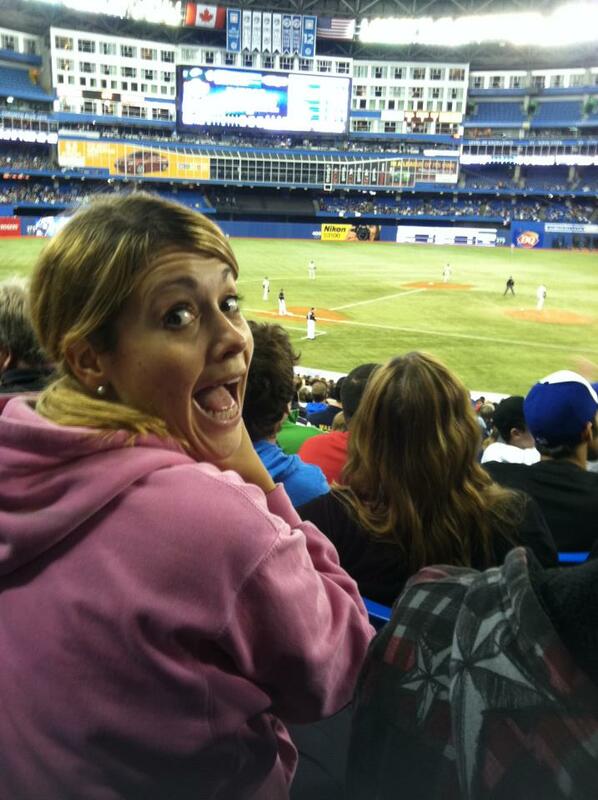 Last weekend I was in Toronto for work and the only thing I did outside of work was go to the Yankees/Blue Jays game on Friday night with a gaggle of colleagues. 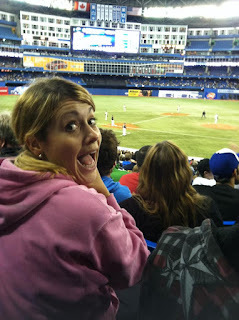 You might be surprised to find that cheering for the Yankees helped me make some friends - a Canadian in front of me turned around and wanted to know why a girl like me was cheering for the Yankees. We chatted for a while and of course the conversation turned to hockey - we were in Canada, remember - and then I tuned out and tried yet again to explain to my British friends how baseball is different than Rounders. I was sitting in a hotel lobby at a registration desk helping people get their badges for a conference. Man: in a foreign accent Can you tell me where the &$*&#$# room is?! Me: Are you looking for the restroom? Man: NO NO NO! (Doing pee pee dance) THE WASH ROOM!!!! I put this story on facebook, but it cracks me up every time. Lost in translation, apparently. Then it happened again, about 30 seconds later with another guy. I also decided on my halloween costume. Let's just say that I'm rocking a princess costume this year. Just. You. Wait. This weekend I am going to Utah to visit my parents - the first time since their accident back in June. We have fun plans like getting my hair did with my mom and going fishing with my dad up at Strawberry. I'm also having a birthday dinner with my nephews and niece. Tons of fun packed into one weekend. Maybe if I'm lucky my mom will make me tuna casserole or tacos. And see some of you? Have your people call my people, if you know what I mean. Hard to believe that 10 years ago I was in Logan, Utah, and now I actually live in New York City. A lot of lives have been changed due to those events and I hope that we can feel more love towards our fellow men always. Since we are remembering things today, last weekend my girlfriends asked me re-tell them the story of the time that my ex-boyfriend rode in an avocado truck as a stowaway in Mexico ON A FERRY to spend the weekend with me. Click here to check it out. Please keep in mind that it was written over 3 years ago and the story itself actually happened in 2006. Also, it is awesome. Well, it is official. I'm no longer in my 20's. The night of my birthday, I was laying in bed with one of my best friends and she said "Do you feel different?" I looked at her and said "Nope" and she said "See? Not so bad, right?" I will post all the gory details of my birthday celebration in the next few days, but for now, I just wanted you to know that I made it. I'm not exactly sure how I got here, but here I am and 30 feels just fine. This week I was sitting on the patio of my new apartment with friends, playing hearts and I seriously thought to myself: "Life. is. good." Someone told me a few months ago that I didn't seem settled in New York. I didn't know exactly what he meant by that and after doing a lot of thinking and soul searching and purging, I'd like to officially announce that I am settled. And it feels so good. I have been to a sporting event in Queens - the US Open - maybe you have heard of it? 6th meal will undoubtedly happen at Chick-Fil-A tomorrow morning when I have not slept at all and arrive in South Carolina with 3 of my besties. If this is any indicator of what the coming decade is going to be like, then bring it. This last one has been pretty amazing. Also, I need to lay down. I am quite tired. This is an entirely new level of red pants. Hipster preppy red pants! I seriously stopped this guy in the subway to ask him if I could take a photo of his red pants. WHALES! I have absolutely no shame. He probably thought I was kidding about the pants - but obviously I do not care the least about his face. Watched Rafa at the US Open. Who doesn't love him? Went to see Joshua Radin & Sara Barielles in Central Park. On nights like that, I am reminded why I am head over heels in love with this city. This morning I had breakfast with my friend Dan - who I hadn't seen since I was 18. It is so great catching up with old friends. In other news, I have done my hair 4 of the last 5 days. That might be some sort of new record for me. Watch out, world! I failed to take a lunchtime update photo, but imagine me sitting in Bryant Park with a good looking, funny man who took me to lunch. Post-work with Rachael. If you call eating cherry licorice and cheezits a treat, that is fine. I call it dinner. Sometimes it is weird to think that Rachael and I don't share a bedroom door anymore. Just so glad I was able to celebrate with her today. Love you, Rach. Scott took me to 4th meal at Shake Shack and it was delicious. By that time, my eye was being weird and though it looks like I am crying, I am just fine. JUST FINE! I surely don't spend as much time with Scott as I'd like to, so I'm glad he came to take me out for my pre-celebration. I did celebrate Scott's 30th with him here in New York a few years ago. Thanks for making me feel so loved this week and especially today, friends. I can't begin to tell you how lucky and blessed I am in the friend department. Sometimes I try, but it is always a fail. I have the best - just believe me. I wish you were all here with me all the time. Today someone asked me where my closest friends live. San Francisco, Salt Lake, Rockville, Arlington, Seattle, San Diego, Charleston, LA, Phoenix, Tucson, Syracuse, San Jose, Palo Alto, Huntington Beach, Provo, and New York. Is that a good answer?